Rendering adopted by many commentators for the Hebrew "ḳippod," for which the English versions have correctly Bittern. The porcupine (Hystrix cristata) is, however, very common in Palestine. It is considered by the natives as a larger species of hedgehog. Thus the Arabic "ḳunfod" (hedgehog) is often applied to the porcupine also. 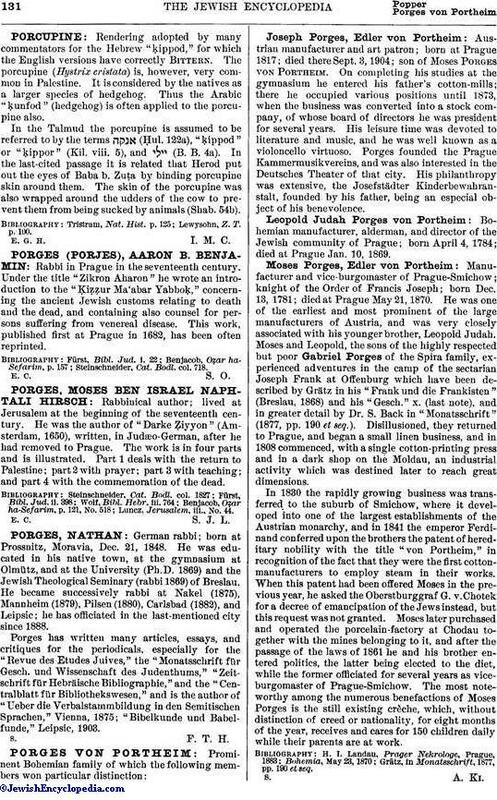 In the Talmud the porcupine is assumed to be referred to by the terms (Ḥul. 122a), "ḳippod" or "ḳippor" (Kil. viii. 5), and (B. B. 4a). In the last-cited passage it is related that Herod put out the eyes of Baba b. Zuṭa by binding porcupine skin around them. The skin of the porcupine was also wrapped around the udders of the cow to prevent them from being sucked by animals (Shab. 54b). Lewysohn, Z. T. p. 100.